"If you want to do something new with an old classic, give this one a shot." Bring a large pot of lightly salted water to a boil. Cook elbow macaroni in the boiling water, stirring occasionally until cooked through but firm to the bite, 8 minutes; drain. Rinse macaroni with cold water until cool; drain. 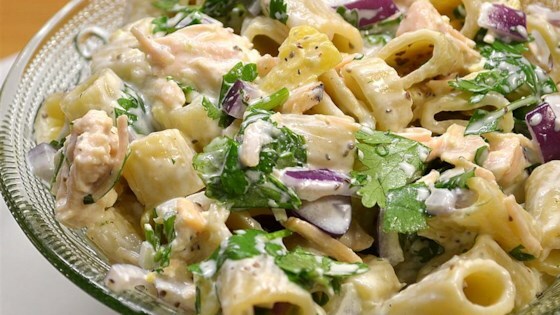 Mix macaroni, chicken, mayonnaise, pineapple with about half the reserved juice, cilantro, red onion, and salt together in a large bowl. Cover bowl with plastic wrap and refrigerate until chilled, at least 15 minutes. The nutrition data for this recipe includes the full amount of the juice. The actual amount of the juice consumed will vary.